Hi. I hope everyone had a great Christmas and is looking forward to starting the New Year. We had a great Christmas with family and it was great to see the excitement on the boys faces! 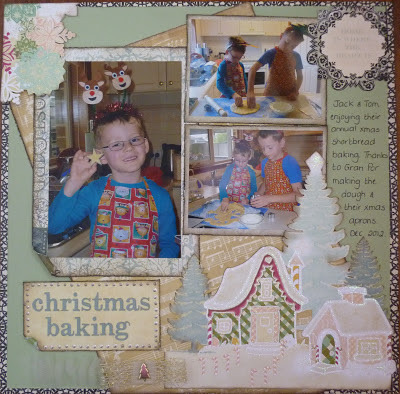 Now onto my entry for Scrap the Boys December challenge. This month was to use Christmas photos and create a LO using non traditional Christmas colours. I had some Websters waiting for Santa paper that I had bought about 2 years ago (LOL I like to collect) and I thought it was a perfect match for my photos. Jack and Tom had a great time making our traditional Christmas Shortbreads. Love that you used several photos! This is lovely! And how cool we their aprons! Thanks for playing at STB :).